Launched by the United Nations Refugee Agency (UNHCR), the 1 Billion Miles to Safety raises awareness of the long, precarious journeys that many refugees take and calls on the public to amp up support. “Every day, we are inspired by the acts of kindness from people who are doing their very best to improve life for refugees: the activists, the communities hosting refugees, businesses, donors, volunteers,’” said UNHCR Deputy High Commissioner Kelly T. Clements. “This campaign will encourage people to support refugees through something they are already doing – walking, cycling, running,” she added. According to UNHCR, people who are forced to flee travel approximately 1 billion miles every year to reach the first point of safety. In 2016, South Sudanese refugees travelled over 400 miles to reach Kenya while Rohingya refugees in Myanmar travelled up to 50 miles in search of safety in Bangladesh. 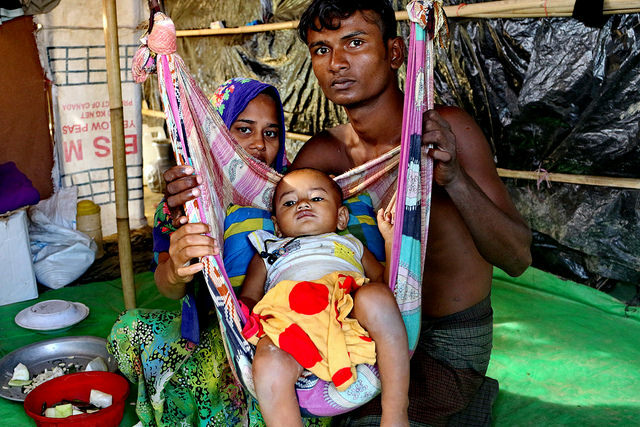 Later aided by the U.N. agency, Alin Nisa and her family were forced to flee from Myanmar to Bangladesh after an armed group attacked the village and abducted community members. Crossing mountains and rivers, Nisa carried her two young children while her husband carried his mother who could not walk. They travelled 60 miles on foot, finally reaching the Kutupalong refugee settlement in Bangladesh. Similarly, Zeenab and her family fled Syria after their home was destroyed and travelled over 90 miles to Jordan’s za’atari refugee camp. “We’re grateful. Winter here is difficult, but it’s still better than Syria,” she told UNHCR. And how better to understand refugees’ plight than actually walking in their shoes and covering the same distance? Clements highlighted the importance of remembering refugees’ very real and dangerous journeys, especially as misconceptions continue to be spread about them. Such narratives have been most apparent in the United States which has seemingly shut the door on refugees. The Trump administration first implemented a 120-day refugee ban, followed by a ban on refugees from “high-risk” countries including South Sudan and Syria. In January 2017, the U.S. government cut the refugee quota by more than half, which led to only 22,000 refugees being resettled in the country in 2018, the lowest rate since 1980. Most recently, the administration has deployed troops at the U.S.’ southern border in an effort to prevent refugees and migrants who have travelled across Central America from entering the country or seeking asylum. Anti-refugee rhetoric has also been on the rise in Europe, including Belgium which has seen violent riots against the country’s participation in the GCM. People across 27 countries will take part in the 1 Billion Miles to Safety campaign, and UNHCR hopes to raise over 15 million dollars to support refugees with registration, food, water, shelter, and healthcare. UNHCR’s funding requirements for 2019 amount to a record 8.5 billion dollars and has thus far received 926 million dollars in pledges. Though the GCM is a stepping stone towards awareness and action, there is still much left to do. Globally, over 68 million have been forcibly displaced. Of this, 25 million are refugees, a figure that has increased by almost 3 million within just one year.